- 45 missions across four difficulty settings. 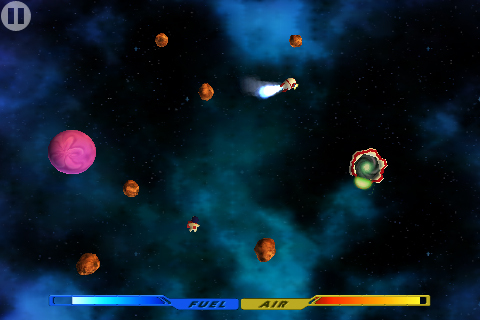 - Planets and Asteroids will have gravity and attract the ship, allowing players to float around the level. - Black Holes will attract the ship with even more ferocity. - White Holes have a reverse gravity field, pushing the ship away. - Mission success is ranked on several factors: remaining fuel, remaining air, astronauts collected. - Awarded Silver, Gold or Brick medals based on final mission outcome. PLAYHAVEN - The More Games menu now features Playhaven support, so you can check out other games within Blast Off!